and it has therefore also been a major source for my description of this issue in the ... the word order variation under discussion can be described in a more. constitutes a claim to ground ambitious lyric in the natural music of a ..... He is the Albert Ayler of the recorder, and the final poem ... Taken out of the beer hall,. a partial word over Î£ is a sequence of symbols from Î£ . Denoting the set of ... the minimal state complexity of a DFA accepting L or the minimal state com-. Harry van der Hulst backed me up at a moment when the whole project appeared to fail. He discussed my plans with me and supported me in every possible. Feb 19, 1993 - As a concrete example of the domains, templates for the operators needed ..... have initial conditions fG ; I1; :::; Ingand goals fG ; G1; :::; Gng. We define a cartesian partial order reduction technique that allows to safely ...... the Workshop on Software Model Checking, pages 338â349, June 2003. 8.
that the majority of the words in languages such Ã¤s Dutch or English take up ... incoming Information Ã¤s long Ã¤s it is available, and recode this Information. describing contour shapes in babbling and one-word utterances, it sheds little light on the internal structure of contours realised on multi-word utterances. English, as with heavy NP shift or the dative alternation (e.g., Arnold et al., 2000; ..... 'Which girl looks up Frank' (SVO) or 'Which girl does Frank look up' (OVS) b.
occupied by the subject or by some other constituent, such as the direct object. In particular situations, however, this commonly observed variation in word order is 'frozen' and only the subject appears in first position. We hypothesize that this partial freezing of word order in Dutch can be explained from the dependence of the speaker's choice of word order on the hearer's interpretation of this word order. A formal model of this interaction between the speaker's perspective and the hearer's perspective is presented in terms of bidirectional Optimality Theory. Empirical predictions of this model regarding the interaction between word order and definiteness are confirmed by a quantitative corpus study. Even languages with a relatively fixed word order, such as Dutch, allow for variation in word order. In Dutch, the first position in the sentence is usually occupied by the subject, as is illustrated by (1). However, in particular circumstances another constituent may come first in the sentence. Examples (2) and (3) show that the first position can also be occupied by a direct object or an indirect object, respectively. Why does such variation occur? And what makes a speaker choose either of these forms? In general, there seem to be few restrictions on the occurrence of subjects in first position. The occurrence of other constituents in first position, in contrast, seems to be strongly restricted by context and other factors. However, very little empirical work has been carried out to investigate the exact nature of these restrictions (Jansen & Wijnands, 2004, is a notable exception). Empirical studies investigating word order variation in the postverbal domain in English, as with heavy NP shift or the dative alternation (e.g., Arnold et al., 2000; Bresnan et al., 2007), have shown that such word order variation is driven by factors like givenness, weight, pronominality, definiteness, and animacy. Furthermore, these studies have emphasized the need to consider actual language use rather than examples contrived by linguists. Only by considering actual language use in context using advanced statistical modeling techniques, these authors argue, is it possible to identify and disentangle the highly correlated and often gradient factors that influence language use. The present study takes a similar approach and investigates which factors influence the variation illustrated in (1)-(3) regarding the preverbal position in Dutch, by examining word order in the spoken Dutch corpus Corpus Gesproken Nederlands (CGN). linguistic choice and the requirement that the chosen form must be such that the hearer can recover the intended meaning. This paper is organized as follows. 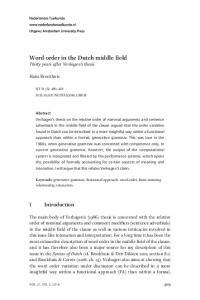 In Section 2, we discuss word order in Dutch in more detail. Here, we argue that the attested variation regarding the first sentence position in Dutch may cause the intended meaning of the sentence to be unrecoverable for a hearer. This problem can be circumvented if the speaker restricts word order variation in those situations in which the hearer has no other clue than word order to arrive at the interpretation of the sentence. In Section 3, it is shown that this restriction on word order variation can be captured in terms of bidirectional Optimality Theory. The proposed model predicts word order freezing when the subject is not higher in definiteness than the object. This prediction is tested in a corpus study, which is the topic of Section 4. Section 5 discusses the results of this corpus study and interprets these results in the light of the bidirectional model. relation between grammatical function and level of definiteness in the spoken Dutch corpus CGN. A hearer encountering (4) could in principle assign an SVO interpretation or an OVS interpretation to this sentence, as both word orders are possible in Dutch. Under the first interpretation, Fitz is the subject in canonical position. Under the second interpretation, Fitz is the fronted object. Given the word order possibilities in Dutch, hearers should be in doubt as to whether the speaker intended (4) to mean that Fitz saw Ella or that Ella saw Fitz. However, presented out of context and in the absence of any intonational clues, Dutch hearers will interpret sentences with a animate definite subject and a similar object as conveying an SVO interpretation (Cannizzaro, 2010). Their preferred interpretation thus reflects the observation that the first constituent of the sentence most likely is the subject. So in the absence of other clues, hearers prefer the interpretation that is in accordance with canonical word order. This observation about hearers' preference results in the potential problem that certain meanings may be unrecoverable. Suppose that the speaker intends to convey the meaning that Ella saw Fitz. In this case, (4) would be a poor choice because hearers will interpret Fitz in (4) as the subject. So the meaning that Ella saw Fitz is unrecoverable from the form in (4) if no other clues are present. This suggests that the hearer's interpretation may have implications for the speaker's freedom of word order variation, and that the speaker's choice is limited when word order is the only available clue to arrive at the interpretation of the sentence. In the next section, we will propose an account of word order variation in Dutch that formalizes this intuition. The proposed account is compatible with multi-factorial accounts of word order variation such as advocated by Bresnan (see Bresnan et al., 2007, and subsequent work), but is stronger in the sense that it provides an explanation for the speaker's choice of form as partially motivated by the strive for communicative success, rather than merely revealing correlations between the choice for one form over the other and particular properties of these forms or their contexts of use. In prose: in a grammatical form-meaning pair , f is the best way to express m and m is the best way to interpret f. The following two, possibly conflicting, constraints are at work in Hindi word order, ranked as in (9), with Top-Left being stronger than Sub-Left. Since the precise formal semantics of the sentences is not at issue here, we use a pseudo-semantic representation as the input. The pseudo-operators T and ? are used to indicate topics and questioned material, respectively. A T in front of an argument indicates that this argument is the topic. Instead of restricting the candidate set like this, one could also implement the influence of case through (a) high ranking constraint(s). This does not change the analysis fundamentally. Example (12) is a case of word order freezing analogous to (4) in Section 2 and the Hindi example in (6). The examples in (13) are however not frozen to SVO. Here, we shall first informally discuss why the OVS readings are available to begin with. A formal model of the ambiguity of the sentences in (13) and the lack of ambiguity of (12) follows below. Example (13a) appears in a discussion of word order freezing in Zeevat (2006). The availability of OVS is a surprise under a bidirectional model of freezing that only considers information expressed through surface form, such as case and agreement, in identifying subject and object. In (13a), neither the NPs nor the verb tells us what constituent is the subject. Why do we not see the emergence of the unmarked SVO reading as in (12)? We follow Kaan (1999; 2001) in assuming that Wh-constituents are indefinite. This means, however, that in terms of definiteness, the OVS reading is a less marked reading. It allows us to have an indefinite object and a definite subject (thus conforming to the pattern shown in Table 1 in Section 2). It seems that this preference stemming from definiteness is strong enough to bring the OVS interpretation to the front. The explanation of (13b) follows a similar reasoning. In (13b), SVO would involve focusing the subject and backgrounding the object, whereas OVS allows us to focus the object and background the subject. The latter is an unmarked situation in terms of information structure (Zerbian, 2007). Finally, in (13c), OVS is an unmarked reading in terms of animacy as an inanimate subject is a marked situation (Aissen, 2003). We can summarize the discussion regarding (12)-(13) as follows. The available OVS readings in (13), which are marked in terms of argument order, are unmarked in some other linguistic dimension. It is this conflict in markedness that triggers the ambiguity in the sentences in (13). Word order in (12), on the other hand, is frozen because there is no information whatsoever that might promote the OVS interpretation. The alternative dimensions of markedness are captured in an OT model by adopting the following constraints, which have been motivated independently in the literature (e.g., Aissen, 2003). In stratified strong bidirectional OT, the variation in (13) can be modeled by putting the constraints governing word order (e.g., Sub-Left, Top-Left) in the same stratum as the constraints preferring an unmarked association between animacy/definiteness/information structure and grammatical function. When the constraints within this stratum conflict, variation results. Let us illustrate Bouma's proposal by working out the ambiguity of the wh-question in example (13a). For clarity of exposition we restrict ourselves to a subset of the constraints mentioned in (14). We refer the reader to Bouma (2008; to appear) for examples and discussion of a larger grammar containing the other constraints. In addition, we assume the high ranked constraint Wh-Left, that forces wh-constituents to be initial irrespective of their grammatical function. The SVO reading of (13a) corresponds to the form-meaning pair in (17a). The OVS reading corresponds to the one in (17b).  which girl looks Frank up? Frank looks which girl up? The OVS reading corresponding to (17b) is an optimal form-meaning pair in the subcase of (16) that *Sub/Ind >> Sub-Left. As Tableau (18a) shows, the constraint *Sub/Ind is, in production, violated by properties of the input alone. It thus appears to be an unusual type of constraint. After all, the input is given and, therefore, violable constraints that only relate to the input do not influence optimization at all. However, the presence of the constraint in a bidirectional grammar makes sense, as it is a constraint on the output in comprehension. For reasons of parsimony, we assume identical grammars between both optimization directions. (19b) Comprehension (Dutch) which girl looks Frank up? The two meaning inputs in (18a) and (19a) both result in the same surface form, because of the high ranked Wh-Left. We thus have neutralization of a meaning difference in production. The conflict between *Sub/Ind and Sub-Left in the same stratum causes variation in interpretation of a form in comprehension. Put together, the result is an ambiguous form in our bidirectional model. The grammar in (16) also predicts that if we make the second NP in (13a) a less likely subject by turning it into an indefinite NP, only the SVO reading should remain: *Sub/Ind does not prefer the OVS reading anymore and the decision is up to Sub-Left. This prediction is borne out in Dutch. evidence of the influence of the hearer's perspective in production data, that is, in a corpus. In the next section, we shall see that we can indeed find such evidence in a corpus of spoken Dutch: Speakers more often use non-canonical word order when the hearer would be able to retrieve the correct grammatical function assignment on the basis of definiteness of the arguments. To see how this prediction follows from a quantitative re-interpretation of our bidirectional OT model of word order, consider the case in which a speaker has some reason to prefer a non-canonical order of subject and object. If we have definiteness superiority, the speaker is free to use this word order because the chance that the hearer will be confused is low. Definiteness inferiority, however, constrains the speaker because the chance that the hearer will be confused is higher. Table 2 shows corpus data on direct object fronting and its relation to definiteness of subject and object. The data comes from 16,146 transitive V2 main clauses extracted from the spoken Dutch corpus CGN, which is a mixed genre corpus with speakers from the Netherlands and Belgium. The argument NPs are assigned to one of three definiteness levels on the basis of surface form characteristics: indefinite full NPs (common nouns with indefinite article or no determiner), definite full NPs (common noun with definite article or universal quantifier, proper names), pronouns (personal or demonstrative). Although some pronouns are marked for case and thus supply unambiguous information about their subject status, we include pronouns in our corpus study because far from all Dutch pronouns show case. Case syncretism is found at least for: ze 'they'/'them' (weak), je 'you' (sg, weak), u 'you' (formal), jullie 'you' (pl), het 'it' and all demonstrative pronouns. For details and technical background of the extraction method, we refer the reader to Bouma (2008). A few general trends can be seen in Table 2, if we confine ourselves to the row and column totals. First, we may note that subjects tend to be pronominal, but that many objects are pronominal, too. This is a fact about spoken language in general. We may add that many of the pronouns are 1st or 2nd person. However, given the overwhelming amount of pronouns in spoken language, pronominal objects are in fact much rarer than expected by chance. Secondly, we point out that object fronting is relatively frequent in two (not mutually exclusive) circumstances: when the object is pronominal and when the subject is pronominal. The former is caused by the large proportion of demonstrative pronoun objects. Demonstrative pronouns have a strong tendency to appear in initial position. The latter is caused by the large proportion of personal pronouns as subjects: personal pronouns have a tendency to avoid the first position. When the subject is a personal pronoun, the object is thus freer to move into first position (Bouma, 2008). Now let us turn to the predictions in (22). In Table 2, we have highlighted the cases of definiteness superiority with a darker gray and the cases of definiteness inferiority with a lighter gray. Table 3 summarizes the relation between object fronting and relative definiteness by combining cases with the same relative definiteness. 0.927) and bootstrap resampling shows no sign of overfitting (Harrell et al., 1999).4 The parameter estimates of the non-freezing related factors (i.e., complexity of subject and object, and NP form) are in line with earlier work and thus do not indicate any problems with the model: Other things being equal, the more complex an object is, the lower the chance that it will be fronted. Likewise, objects that are higher on the definiteness scale are more likely to be fronted, with the exception of personal pronominal objects, which are fronted even less often than indefinite full NP objects. Interestingly, the model suggests that the absolute level of definiteness of the subject is only relevant when subjects are demonstrative pronouns, in which case the odds of direct object fronting are drastically lowered. We speculate that this is because in these cases the preferred option is to put the subject itself in initial position. The model including the three level factor relative definiteness is a significantly better fit than the same model without this factor (G2 = 11.1, df = 2, p = .004). We conclude that relative definiteness is a factor in predicting direct object fronting. Model fitting and inspection was done with the "Design" library (http://cran.rproject.org/web/packages/Design/) of the R language for statistical computing (http://www.r-project.org). the BiOT model predicts that animacy and givenness will have similar effects on the speaker’s choice of word order as definiteness, as subjects are generally not only higher in definiteness than objects, but also tend to be higher in animacy, more given, and intonationally less prominent than objects (which is reflected by the OT constraints in (14) in Section 3). As a consequence, relative animacy, givenness and prosody may also provide the hearer with cues about the intended word order, and hence allow the speaker to use noncanonical word order. Thus we expect object fronting to be more frequent if (i) the subject is higher in animacy than the object, (ii) the subject is more given than the object, and (iii) the subject is intonationally less prominent than the object. We have not been able to test these predictions yet because of the unavailability of a sufficiently large corpus of Dutch that is annotated for information such as animacy and givenness. A further prediction of the BiOT model is that the relative definiteness effect we observed in the corpus of spoken Dutch, as well as the expected trends of relative animacy and relative givenness, are the indirect result of the hearer's interpretational preferences. That is, Dutch speakers select a particular word order because Dutch hearers prefer subjects to be definite, animate and given. Indeed, definiteness and animacy have been found to be important sources of information for Dutch hearers in resolving temporary subject-object ambiguities during online sentence comprehension (e.g., Kaan, 1999; Lamers, 2005). This study related the factors found to influence word order variation in a corpus of spoken Dutch to a formal model of grammar that distinguishes the speaker's perspective from the hearer's perspective. Whereas the first position in Dutch sentences may be occupied by subjects and objects, OVS word order is dispreferred in those situations where hearers have no other sources than word order to determine the grammatical functions of the arguments. This pattern of partial word order freezing provides evidence that the speaker's linguistic choices are at least partially driven by their aim to avoid potential misunderstanding by the hearer. Aissen, J. (2003). Differential object marking: iconicity vs economy. Natural Language and Linguistic Theory, 21, 435-483. Arnold, J., Wasow, T., Losongco, A. & Ginstrom, R. (2000). Heaviness vs. newness: The effects of structural complexity and discourse status on constituent ordering. Language, 76, 28-55. Blutner, R. (2000). Some aspects of optimality in natural language interpretation. Journal of Semantics, 17, 189-216. Blutner, R. de Hoop, H. & Hendriks, P. (2006). Optimal Communication. Stanford, CA: CSLI Publications. Bouma, G. (2008). Starting a Sentence in Dutch: A Corpus Study of Subject- and ObjectFronting. Dissertation, University of Groningen. Bouma, G. (to appear). Production and comprehension in context: The case of word order freezing. 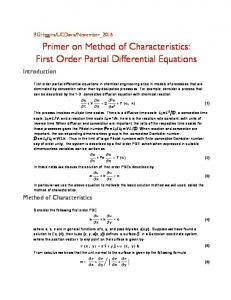 To appear in A. Benz & J. Mattausch (Eds) Bidirectional Optimality Theory. John Benjamins. Bresnan, J, Cueni, A., Nikitina, T. & Baayen, R. H. (2007). Predicting the dative alternation. In G. Bouma, I. Krämer, & J. Zwarts (Eds) Cognitive Foundations of Interpretation, (pp. 69-94). Amsterdam: Royal Netherlands Academy of Science. Cannizzaro, G. (2010). Animacy and early word order. In: J. Costa, A. Castro, M. Lobo & F. Pratas (Eds) Language Acquisition and Development: Proceedings of GALA 2009. Newcastle upon Tyne, UK: Cambridge Scholars Publishing. CGN (2004). Corpus Gesproken Nederlands, v1.0. Electronic Resource. See: http://lands.let.ru.nl/cgn/home.htm. Comrie, B. (1979). Definite and animate direct objects: A natural class. Linguistica silesiana, 3, 13-21. Flack, K. (2007). Ambiguity avoidance as contrast preservation: Case and word order freezing in Japanese. In L. Bateman, M. O'Keefe, E. Reilly, & A. Werle (Eds) UMass Occasional Papers in Linguistics 32: Papers in Optimality Theory III (pp. 57-89). Booksurge Publishing. Harrell, F. E., Lee, K. L & Mark, D. B. (1996). Tutorial in biostatistics, multivariable prognostic models: Issues in developing models, evaluating assumptions and adequacy, and measuring and reducing errors. Statistics in Medicin, 15(4), 361-387. Hendriks, P., de Hoop, H., Krämer, I., de Swart, H., & Zwarts, J. (2010). Conflicts in Interpretation. London: Equinox Publishing. Jakobson, R. (1936). Beitrag zur allgemeinen Kasuslehre. Gesamtbedeutungen der russischen Kasus. In Travaux du Cercle Linguistique de Prague 6 (pp. 240-288). Consulted in Word and Language, volume 2 of Selected Writings, 1971 (pp. 23-72). Den Haag/Paris: Mouton. Jansen, F. & Wijnands, R. (2004). Doorkruisingen van het links-rechtsprincipe. Neerlandistiek.nl. Jäger, G. & Rosenbach, A. (2006). The winner takes it all - almost. Cumulativity in grammatical variation. Linguistics, 44(5), 937-971. Kaan, E. (1999). Sensitivity to NP-type: Processing subject-object ambiguities in Dutch. Journal of Semantics, 15(4), 335-354. Kaan, E. (2001). Subject-object order ambiguities and the nature of the second NP. Journal of Psycholinguistic Research, 30(5), 527-545. Kager, R. (1999). Optimality Theory. Cambridge: Cambridge University Press. Kuno, S. (1980). A note on Tonoike's intra-subjectivization hypothesis and A further note on Tonoike's intra-subjectivization hypothesis. In Y. Otsu & A. Farmer (Eds) Theoretical Issues in Japanese Linguistics (MWPL 2). MIT Working Papers in Linguistics (pp. 149-157, 171-185). Lamers, M. (2005). The on-line resolution of subject-object ambiguities with and without case-marking in Dutch: Evidence from event-related brain potentials. In M. Amberber & H. de Hoop (Eds) Competition and Variation in Natural Languages: The Case for Case (pp. 251-293). Elsevier. Lee, H. (2001). Markedness and word order freezing. In P. Sells (Ed.) Formal and Empirical Issues in Optimality Theoretic Syntax, Volume 5 of Studies in Constraint-based Lexicalism. Stanford, CA: CSLI Publications. McCarthy J. J. & Prince, A. (1994). The emergence of the unmarked: Optimality in prosodic morphology. In M. González (Ed.) Proceedings of the North East Linguistics Society 24 (pp. 333-379). Amherst, MA. Morimoto, Y. (2000). 'Crash vs yield': On the conflict asymmetry in syntax and phonology. Manuscript Stanford University. O'Brien, R.M. (2007). A caution regarding rules of thumb for variance inflation factors. Quality & Quantity 41(5), 673-690. Prince, A. & Smolensky, P. (1993/2004). Optimality Theory: Constraint Interaction in Generative Grammar. Malden, MA: Blackwell. Tonoike, S. (1980). Intra-subjectivization; and More on intra-subjectivization. In Y. Otsu & A. Farmer (Eds) Theoretical Issues in Japanese Linguistics (MWPL 2). MIT Working Papers in Linguistics (pp. 136-148, 157-171). Zeevat, H. (2006). Freezing and marking. Linguistics, 44(5), 1095-1111. Zerbian, S. (2007). Subject/object-asymmetry in Nothern Sotho. In K. Schwabe & S. Winkler (Eds) On Information Structure, Meaning and Form, Linguistik Aktuell 100 (pp. 323347). Amsterdam: John Benjamins. Report "Partial Word Order Freezing in Dutch"